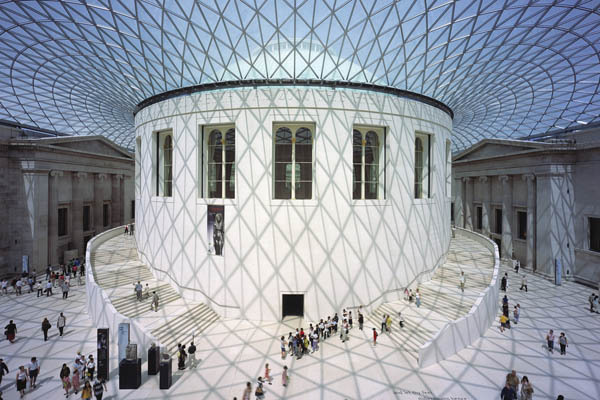 Visit The British Museum on a private two hour tour, or include it on a flexible day in London. Prices are per private group not per person. Prices do not include entrance fees or meals unless stated. This tour is available in most languages. Select your language on checkout. The British Museum was founded in 1753 and today has approx six million objects from antiquity to today's i-pod from all around the world giving an insight into ancient cultures and civilisations. You will see the three ancient scripts on the Rosetta Stone from Egypt, as well as architectural relics from temples and mausoleums in Mesopotamia, Assyria, Greece etc. Hear about the Lion Hunt and see the huge statues of Pharaoh Rameses the Great who had over 70 children. Lord Elgin transported many pieces of the friezes showing the pan-Athenic festival of the ruins of the Parthenon at the Acropolis in Greece to London, and a special hall was constructed so they could be on permanent display to all. The Enlightenment Gallery shows collections of souvenirs wealthy 18th century British travellers brought home from their journeys, appreciating art and cultures of other civilisations, and wishing to share these treasures with others. You will learn about preservation of the dead from Egyptian Mummies, or "Ginger"- to the English bog-man. In England, art objects and valuables were at times of trouble hidden underground for fear of invaders. Recently many such Hoards have been discovered. In the British Galleries you will see ancient Jewellery, weapons, armouries, plates, cutlery - even Roman postcards! Items were imported, brought by immigrants or produced in Britain, giving us an insight into earlier cultures and civilisations of our predecessors of Celtic, Roman, Ango-Saxon, Viking or Norman origin, as well as more recent world-wide migrants from which today's multi-cultural nation derived. Harry Potter fans will love the Lewis chess set found on the Scottish island. Further interest could include the Islamic gallery, European and Chinese porcellain, clocks, medicine or money from around the world. On entering the museum, walk ahead into the Great Court. This is the brightly lit area with the geometric glass roof. Your guide will meet you by the benches immediately to your right as you enter the Great Court.